Hello everyone - looooong time no post. For that I do sincerely apologize! I have been doing so well after surgery that I figured that feeling of 'wellness' would just continue. I hit a WALL this past.. Well, 10ish days. It has not been fun. All this amazing colour that I had (seriously, my eyes and cheeks and skin were all AMAZING looking, even without makeup) now I sort of look like a walking corpse. I would say zombie, but zombie are rad and I am not lately. I actually scared myself the other evening. I was washing my face and I swear my eyes were colourless and lifeless. I could go on and on about how terrible I have been feeling AND looking, but I'm here to discuss that. A few posts back, Li Lian mentioned the website http://wah-nails.com/, so of course I had to check it out. 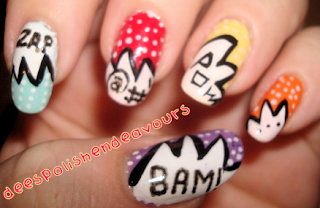 They do some really fun nail art.. Most of which I find somewhat simple to replicate. I of course had to test out at least one of their designs asap. Sorry the photo suuuucks! I really didn't want to stand around a whole bunch to try to get a decent shot. I think this particular design is a lot of fun. My sister did see some of the other photos from that site that I saved in my inspiration folder - she wants to test them out as well!! Oh, duh, the colours used are (from thumb to pinkie): OPI A Grape Fit, Essie Mint Candy Apple, CG Heli-Yum, CG Lemon Fizz & Orly BLANK because I cannot remember.. I keep meaning to post on here because I really do miss it AND all of you.. Just. So. Tired! Anyways, just a quick update from moi! I hope everyone has had a good start to August and that it continues. I will try to post up again asap! Your nails look awesome!!! I hope you feel better soon Dee! I hope you feel better really soon. Thanks for taking the time to post - love this mani. That is so cute!! I love it...and I'm glad to hear you're feeling (somewhat) better..